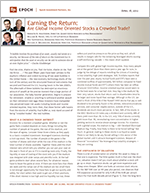 Earning the Return: Are Global Income Oriented Stocks a Crowded Trade? - Epoch Investment Partners, Inc. Earning the Return: Are Global Income Oriented Stocks a Crowded Trade? Fool me once, shame on you. Fool me twice, shame on me. Fool me thrice . . . ? The past fifteen years have been witness to the euphoric inflation and violent bursting of two asset bubbles in the United States — the new-economy technology stocks of the turn of the century and the structured financial instruments that secured and financed the U.S. housing boom in the late 2000’s. The aftermath of these bubbles has destroyed an enormous amount of wealth at the precise moment that a large portion of our population, the baby boomer generation, begins to prepare for retirement. Unable or unwilling to withstand another assault on their retirement nest eggs these investors have stampeded into perceived lower-risk assets including bonds and income- oriented equities. How ironic then, that these former safe havens from the storms of volatility that buffet us, now stand accused of being “crowded trades”: the new bubbles. What is a crowded trade anyway? Envision for a moment a baseball game. Whether or not the game feels crowded depends on many things including the number of people at the game, the size of the stadium, and the ease of egress. Consider these three criteria as they apply to a classic crowded investment: leveraged investors shorting a mid-cap stock. The number of people at the game is the number of shares sold short while the size of the stadium is the total number of shares available. Together these yield the short interest ratio which tells you whether you can put your coat on the seat in front of you or if it is standing room only. Finally, the liquidity or ease of trading of the stock tells you if the stadium was designed with wide ramps and plentiful exits. At the ball game problems start when several fans, for whatever reason, have to leave the game at once. If there are more fans than there are seats and the ramps out of the stadium are too small there is not enough opportunity for those fans to get out quickly and safely. For short sellers that want to get out of their positions, if the short interest is too high and the liquidity too low, these sellers put positive pressure on the price as they exit, which results in margin calls for the remaining leveraged shorts causing a self-reinforcing cascade — the classic short squeeze. Compare this with global high-income equities. How many people are at the game? More than there were a year ago for sure, to judge by the deluge of reports extolling the virtues of investing in low-volatility, high-yield strategies. Still, TrimTabs reports that over the past year, equity mutual funds and ETF’s have seen a combined outflow of approximately $83 billion compared to fixed-income mutual funds and ETF’s where there has been an inflow of around $243 billion. Income-oriented equities would seem to be the best seats for a bad ball club. How big is the stadium? By their very nature, stocks that return cash to shareholders tend to be larger and more liquid than average. Although in the U.S. we tend to think of the 65% of the Russell 1000 stocks that pay a cash dividend to be primarily found in the utilities, telecommunications services, and consumer staples sectors, outside of the U.S., dividends are much more pervasive. In fact, 94% of the stocks in the MSCI World ex-US index pay a dividend and currently 48% of them yield more than 3%. In the U.S. only 16% of stocks currently yield more than 3%, necessitating more concentration in higher yielding sectors to receive above-average income. For investors with a global scope, the stadium is big — old Cleveland Municipal Stadium big. Finally, how likely is there to be forced selling? Not much. In general, trading in these stocks is as liquid as water. There is not likely to be any forced selling in this sector of the global market until it attracts leveraged investors. Beware of financial “innovations” like leveraged low-volatility strategies —they are coming. There is a lot of consternation on whether this asset is cheap or that one is expensive. The little-spoken truth is that over the short run, valuation doesn’t tell you much about whether a stock will go up or down. Expensive stocks can get more expensive and cheap ones cheaper. When one looks at common stock returns for the S&P 500 over an 80-year plus period, one observes that P/E expansion accounted for only 0.4% of the 9.6% per annum return for that multi-decade period (Figure 1). Over the long-term it is the real components — earnings and dividends — which drive returns. Valuation has a tendency to slowly regress to the mean and is most helpful at the far extremes of expensiveness or cheapness when entire new paradigms and metrics are concocted to justify those valuations. One example is the tech bubble of the late 1990’s when measures like free cash flow and earnings were supplanted by burn-rate and click-through. Another is the U.S. housing boom of the mid 2000’s when a house transformed from a place to live into an asset to be flipped rapidly — spurred on by financial “innovation” gone awry. Valuation itself is not a panacea. It is highly dependent upon the situation. For example, the relative value of a match to a light bulb rises immeasurably in a darkened room if the electricity goes out. This may be somewhat tempered if the room happens to be a powder magazine. In the stock market today, relative valuations between sectors have as much to do with which macroeconomic environment we are in rather than anything intrinsic about the sectors. There is great uncertainty and debate about whether the world is getting slowly better or inexorably worse. This struggle manifests itself in high stock correlations and the violent risk-on/risk-off moves that characterize today’s market. Investors are worried that the power is out in the economy and rightly fear the monetary powder that the world’s central banks have put into the system, most of it packed away for the time being in un-borrowed reserves on central bank balance sheets. Beware the match. It is the stability of dividends, if not the certainty, that make dividend paying stocks attractive in this uncertain environment. Not only do investors seek the income that they can’t get from bonds but they are willing to pay a little bit more for it in uncertain times. The market is a discounting machine and the prices of securities are affected by their expected cash flows and an appropriate discount rate. Although the risk-free discount rate is now effectively zero and therefore inflating the prices of all assets, it is also important to consider the discount rate associated with the uncertainty of future cash flows. Dividend paying stocks of high-quality companies have a far greater certainty than other stocks and therefore demand a lower discount rate. This of course leads to higher valuations during times of economic volatility. Notwithstanding the valuation question in the short run, most equity funds seeking high current income have significant sector exposures to the global utilities, telecommunications, and consumer staples sectors because, to paraphrase Willie Sutton, that’s where the yield is. Although these global sectors traded at a significant valuation premium to the market at the end of the third quarter of 2011, they are currently much more reasonably valued, with the utilities sector trading at slightly more than one standard deviation above its seven-year relative average and the telecom and consumer staples sectors trading in line with their relative averages (Figure 2). Somewhat surprisingly for sectors that are considered to be expensive, the dividend yields of these sectors are close to their seven-year highs (Figure 3). It has become a common refrain how cheap equities have become when compared to bonds. This has been driven by interest rates that are at a generational low. It shouldn’t be surprising then that yield-focused investors are concerned about the effect a seemingly inevitable rise in interest rates will have on income-oriented equities. First and foremost, although there are several events that might cause a rise in interest rates, the two most common are the anticipation of economic growth and the fear of future inflation. Handicapping the cause is important. Unlike fixed-income securities, where a rise in interest rates causes prices to drop, the impact on equities — even high-quality dividend payers — depends upon the reason for the rise. Most people are familiar with the old rule of thumb that interest rates and equity multiples are inversely related. Figure 4, below, shows the relationship between the U.S. 10-year Treasury bond yield and the P/E on the S&P 500 from 1950 to 2012. What this chart masks is that the relationship is different depending on whether investors are fearful of inflation, as they were from 1960 through 1999 (Figure 5), or expecting a pickup in economic growth, as they were between 2000 and 2012 (Figure 6). There is currently great fear that the liquidity unleashed by the world’s central banks will spur runaway inflation. The communicated commitment of the U.S. Federal Reserve to keep rates low until a sustainable recovery is underway likely implies that the first move up in rates will be reflective of an improving economic environment and increasing growth expectations. Although defensive income-oriented equities would underperform those equity sectors with more cyclical exposure, they most assuredly would outperform fixed-income securities. As such, these types of conservative equity strategies are a way to generate current income while maintaining a positive exposure to the improving economic prospects that would herald an initial rise in interest rates. Trades become crowded when investors start to believe that they can get something for nothing and sell out to the greater fool. When multiples are rising, that is often exactly what they get. By contrast, strategies that focus on high-quality companies with significant and growing free cash flows that consistently return value to shareholders in the form of dividends and share repurchases earn their return. It is said that prediction is difficult, especially about the future. Over short horizons multiples will fluctuate. Looking out over the long term, however, in the context of a slow-growing deleveraging economy, it is unlikely investors will be able to count on multiple expansion to be a major driver of returns as it was in the 1980’s and 1990’s. Yet even in this challenging economic environment, it is possible to construct a diversified global portfolio that has a minimum cash yield of 4.5%, another 1.5% from consistent share buybacks and debt pay downs, and a cash flow growth rate of no less than 3%. We call this the 9% solution and have implemented it since 2005 in our Global Equity Shareholder Yield strategy. This indefatigable focus on the tangible drivers of return has resulted in attractive risk-adjusted returns with much lower volatility than the global equity market.